Some of the largest Indian Mounds in the state of Georgia, the Ocmulgee Mounds on the Macon Plateau are a significant part of Georgia history. Built during the Early Mississippian Period, the mounds were the centerpiece of a culture known as the Moundbuilders. Ice Age hunters arrive in the Southeast, leaving one of their distinctive "Clovis" spear points on the Macon Plateau (in the 1930's this became the first such artifact found in situ in the southern U.S.). People adjust to gradually warming weather as the glaciers melt and many Ice Age mammals become extinct. Efficient hunting/gathering; adaptation to a climate much like today; use of the atlatl (spear thrower), woodworking tools, etc. ; white-tail deer becomes a staple; extensive shell mounds along the coast and some inland rivers. 2,500 BC First pottery in this country appears along the Georgia/South Carolina coast and soon filters into what is now Middle Georgia; it is tempered or strengthened with plant fibers which burn out during firing, giving a worm-hole appearance to the vessel surface. Pottery tempered with sand and grit, sometimes decorated with elaborate designs incised, punctated or stamped into its surface before firing; cultivation of sunflowers, gourds, and several other plants; construction of semi-permanent villages; stone effigy mounds and earthen burial and platform mounds; connections to the Adena/Hopewell Cultures farther North and to Weeden Island in Florida and South Georgia. A new way of life, believed to have originated in the Mississippi River area appears on the Macon Plateau. These people, whose pottery is different from that made by the Woodland cultures in the area, construct a large ceremonial center with huge earthen temple / burial / domiciliary mounds and earthlodges, which serve as formal council chambers. Their economy is supported by agriculture, with corn, beans, squash and other crops planted in the rich river floodplain. Indigenous Woodland people in surrounding areas interact with these people, who possess early symbols and artifacts associated with the Southeastern Ceremonial Complex (Southern Cult). The great Macon Plateau town declines and the Lamar and Stubbs Mounds and Villages appear just downstream. These towns are a combination of the old Woodland culture and Mississippian ideas. The Southern Cult, distinguished by flamboyant artistic motifs and specialized artifacts, flourishes at places like Roods Landing and Etowah (GA), Moundville (AL), Hiwasee Island (TN), Cahokia (IL), and Spiro (OK). The Lamar Culture, named for the Lamar Mounds and Village Unit of Ocmulgee National Monument, becomes widespread in the Southeast; chiefdoms marked by smaller, more numerous, often stockaded villages with a ceremonial center marked by one or two mounds; combination of the both Woodland and Mississippian elements. 1540 Chroniclers of Hernando DeSoto's expedition into the interior of North America write the first descriptions of the Lamar and related cultures, ancestors of the historic Creek (Muscogean), Cherokee (Iroquoian), Yuchi (Euchee), and other Southeastern people. Most of their main towns are situated near rich river bottomland fields of corn, beans and squash. Many towns feature open plazas and earthen temple mounds. Public buildings and homes are constructed of upright logs, interwoven with vines or cane and plastered with clay (wattle and daub). Some are elaborately decorated and contain large woodcarvings. DeSoto’s expedition’s 600 men and 300 horses devastate local food supplies; epidemics of European diseases decimate many populations. 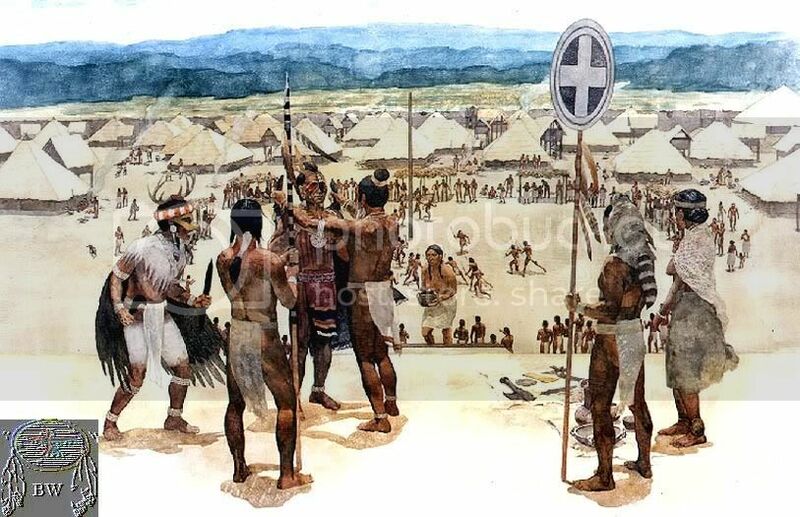 1565 The Spanish establish their first permanent settlement at St. Augustine, set up outposts at towns along the Atlantic coast to the North, and begin to missionize the Indians. Priests and soldiers travel up the river systems to other towns in the interior of the area which would become Georgia. 1670 The British establish Charles Town (Charleston, SC) on the Atlantic coast. Despite Spanish opposition, English explorers initiate contact and trade with towns in the interior. 1690 A British trading post is constructed on Ochese Creek (present Ocmulgee River at the site now protected within Ocmulgee National Monument). A number of Muscogee towns move from the Chattahoochee River to this vicinity to be near the English. At this time, the Ocmulgee river is called Ochese-hatchee or Ochisi-hatchi (various spellings). The towns are known as the Ochese Creek Nation. The British eventually refer to them simply as the "Creeks." They speak variations of the Muscogean language, but their confederacy incorporates other groups, such as the Yuchi, who speak different languages. The Creeks acquire horses from Spanish Florida and guns from the British. Their culture and dress is modified by use of trade goods such as iron pots, steel knives, and cotton cloth. 1704 Col. James Moore, with a band of some fifty men from Charles Town, leads 1,000 warriors from the Creek towns on the Ocmulgee River to Florida. They devastate the Spanish Apalachee Mission system and drive the Spaniards back to St. Augustine. After many of the inhabitants of northern Florida are exterminated, some of the Creeks move into the area and incorporate the survivors into their own group. These people are subsequently known as the Seminole and Miccosuki. 1715 The Yamassee War erupts in protest against British indignities related to the fur trade, including the taking of Indian shipped as slaves to work in Carribean sugar plantations. Many traders in Indian territory are killed. In retaliation, the British burn Ocmulgee Town on Ochese Creek. The Creek towns withdraw to the Chattahoochee River and the Yuchis move with them. The people are known as the Lower Creeks. The Upper Creeks are centered on the Coosa and Tallapoosa Rivers to the northeast. 1733 The Georgia Colony settles on lands along the banks of the Savannah River given to General James Oglethorpe by Chief Tomochichi of the Yamacraws, a group related to the Lower Creeks. The Colony serves as a buffer between South Carolina and Spanish Florida. 1739 General James Oglethorpe, founder of the Georgia Colony, travels the ancient trading path through the mounds and old planting fields at Ocmulgee enroute to Coweta (near what is now Columbus, GA) to meet with the Creeks. 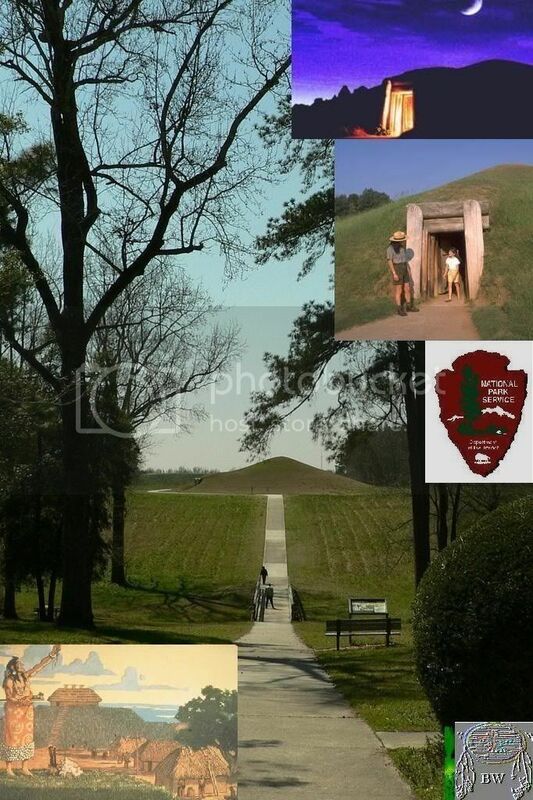 One of his Rangers writes a short description of the mounds at what is now Ocmulgee National Monument. A western boundary for the colony is defined along the Ogeechee River. The area extends along the coast to the present northern border of Florida. their emigration from the west..."
1778 During the Revolutionary War, many Creeks want to remain neutral, but Alexander McGillivray (of Creek-Scottish descent,educated in South Carolina, Principal Chief of both the Upper and Lower Creeks) leads them into an alliance with England. 1793 Invention of the cotton gin greatly accelerates the desire for rich river bottomland. Creek Indians, most of them excellent farmers, quickly adapt to a cotton-based economy. 1805 The first Treaty of Washington cedes the remainder of the land between the Oconee and Ocmulgee Rivers, excluding a 3x5-mile strip known as the Old Ocmulgee Fields Reserve at present Macon, which the Muscogee (Creek) people refuse to give up. The treaty allows the United states to construct a road across the Creek Nation to the Alabama River and facilities for public accomodations along this road. Much of this "Federal Road" follows the ancient Lower Creek Trading Path and eventually stretches from Washington, D.C. to New Orleans. The treaty also provides for a United States military fort on the Reserve to guard the frontier along the Ocmulgee River. This outpost is called Fort Hawkins in honor of Benjamin Hawkins, U.S. Indian Agent to the Creeks and friend of George Washington. 1806 Fort Hawkins is built a short distance from the mounds. It serves as a frontier outpost, trading and center and location for treaty payments to the Creeks until the United States boundary is later extended to Alabama Territory. For the entirety of its existence as a U.S. military fort, it sat on land owned by the Muscogee (Creek) Confederacy. 1811 Shawnee Chief Tecumseh, working with his brother the Prophet, travels up and down the frontier exhorting the Native Americans to discard their plows, whiskey and the white man’s ways. Some of the Creeks join his movement and nearly every town has a so-called "Red Stick" faction. The leaders are as divided as their people. William McIntosh emerges as leader of the faction loyal to the U.S. government. William Weatherford (Red Eagle) becomes the most important leader of the Red Sticks. 1812 General Andrew Jackson (later President) stops at Fort Hawkins during the War of 1812. The fort is an important port of rendezvous for dispatching troops. This war with Great Britain concerns the issues of neutral maritime rights and British involvement in Native American problems along the frontier. Hostilities between Creek loyalists and traditionalist Red Sticks increase. Red Sticks attack and destroy Tuckabatchee and several other Upper Creek towns in northern Alabama. 1819 The ancient Lower Creek Trading Path, now called the Federal Road, is the major artery from North to Southwest for many years (State Highway 49 follows much of this route through Central Georgia). It serves as the postal route from New York to New Orleans. A ferry is built near the mounds on the Old Ocmulgee Fields Reserve, and the first white child, later Mrs. Isaac Winship, is born in the area. 1821 The Creeks give up the lands between the Ocmulgee River and the Flint River. 1823 The Creek Council passes a law providing the death penalty for anyone ceding land without the authority of the Council. Pressures for Indian removal continue to increase. Some Creeks, including William McIntosh, believe removal is inevitable. The City of Macon is laid out across the river from Fort Hawkins. The first newspaper in Middle Georgia, the Georgia Messenger, is published at Fort Hawkins, and a post office is established. 1825 The Treaty of Indian Springs ceding the last Creek lands in Georgia is signed by Chief William McIntosh. His cousin is the governor of Georgia. He sells the Creek lands and is consequently assassinated by his own people. The treaty is declared illegal by the federal government, but Georgia authorities disagree. They press harder for removal. village beaux and belles, and objects of curiosity to strangers. 1836 The Creek War of 1836 ends when about 2,500 people, including several hundred warriors in chains, are marched on foot to Montgomery, AL, and crowded onto barges during the extreme heat of July. They are carried by steamboats down the Alabama River, beginning their forced removal to Indian Territory. During the summer and winter of 1836-early 1837, over 14,000 Creeks make the three-month journey to Oklahoma, a trip of over 800 land miles and another 400 by water. Most leave with only what they can carry. 1839 The Cherokee begin their "Trail of Tears." A few escape and remain in the mountains of East Tennessee and North Carolina where most of their descendants now live on the Qualla Reserve around Cherokee, NC. 1843 The Central Railroad constructs a railroad line into Macon through the Ocmulgee Old Fields destroying a portion of the Lesser Temple Mound and the great prehistoric town. A locomotive "roundhouse" is located near the Funeral Mound. 1840 The huge oak trees on the mounds are cut for timber. Until this time, the Old Ocmulgee Fields and Brown’s Mount (another scenic prehistoric town about 6 miles down river) had been favorite resorts for picnics and parties, first by the officers at Fort Hawkins then by the residents of Macon. Much of the Macon Plateau site becomes part of the Dunlap Plantation. Clay for brick manufacturing is mined near the Great Temple Mound and a fertilizer factor is constructed nearby. over the Ocmulgee River inside the boundary of what is now the Ocmulgee National Monument. Gen. Stoneman destroys Griswoldville, continues to Macon and burns the railroad bridge over Walnut Creek on the Dunlap property. He uses the Dunlap's farm house as his headquarters during the ensuing battle. Failing to take the city, Stoneman and his troops are pursued into nearby Jones County, where they are defeated at Sunshine Church. General Stoneman and his officers are incarcerated at Camp Oglethorpe in Macon and his enlisted men are sent to the infamous prisoner of war camp at Andersonville. Stoneman is the highest ranking Union officer taken prisoner during the Civil War. 1874 A second huge cut for a railroad (still in use) is excavated through the mound area and destroys a large portion of the Funeral Mound. According to Charles C. Jones, in his book, Antiquities of the Southern Indians, many relics and human burials are removed during this work. 1933 A large portion of McDougal Mound is removed to use as fill dirt for Main Street. Motorcycle hill-climbing leaves scars on the slopes and summit of the Great Temple Mound. A group of local citizens are convinced that the mounds are of great historical significance and should be preserved. Led by General Walter A.Harris, Dr. Charles C. Harrold, and Linton Solomon, they seek assistance from the Smithsonian Institution, which sends Dr. Arthur Kelly to organize and conduct archeological excavations on the Macon Plateau. 1934 Archeological treasures are unearthed. As the work progresses, a bill is passed by Congress to authorize establishment of a 2,000-acre Ocmulgee National Park. The archeological effort is largest excavation ever, until this time, undertaken in the country. Labor is provided by hundreds of workers employed under several Great Depression-era public works programs. 1936 President Franklin D. Roosevelt on December 12th signs the Proclamation establishing Ocmulgee National Monument and directing the National Park Service to preserve and protect 2,000 acres of "lands commonly known as the Old Ocmulgee Fields..." Due to economic constraints, only 678.48 are acquired, including 40 acres at the detached Lamar Mounds and Village. Later, an additional 5 acres are added to the Lamar Mounds and Village Unit and the parcel known as Drakes Field is donated to the nation for inclusion in Ocmulgee National Monument by the City of Macon. The park presently encompasses 702 acres. 1940 Great Depression Relief-era crewmen, including members of Civilian Conservation Corps Company 1426 stationed at Ocmulgee National Monument, are drafted into military service as the United States enters World War II. Man are sent to nearby Camp Wheeler which becomes the largest infantry training camp in the nation. 1960's An interstate highway (I-16), constructed through the Macon Plateau Unit, cuts the primary visitor use area off from the park's mile-long river boundary and causes significant hydrological changes to lands located in the river floodplain. During archeological excavation within the highway corridor inside the park, evidence of Muscogee (Creek) and earlier settlement, along with three human burials, are discovered. A number of important prehistoric and historic sites outside the park are destroyed or heavily damaged, including the nearby Gledhill I, II and III (where an Ice Age Clovis spearpoint is found by an artifact collector during removal of fill dirt for road construction), along with the New Pond site, Adkins mound, and Shellrock Cave. Archaic, Woodland, Mississippian and historic Creek villages and campsites across the river, such as Mile Track, Napier, Mossy Oak and Horseshoe Bend, are already damaged by levee construction in the 1940's. 1970's The Swift Creek Mounds and Village, type-site for a widespread Woodland Period culture, is destroyed for construction of a Bibb County Sheriff's Department firing range. Dr. Kelly's early archeological collections, still under the care of the National Park Service, are all that remain of this large site, which was located on the Ocmulgee Old Fields near the Lamar Village Unit of Ocmulgee National Monument. 1992 Descendants of Roger and Eliazar McCall donate almost 300 acres, adjoining the park's Walnut Creek boundary, to the National Park Service. The Archeological Conservancy accepts ownership pending legislation to incorporate it into Ocmulgee National Monument. The land, owned by this family for almost 175 years, has been designated the Scott-McCall Archeological Preserve. 1997 The Old Ocmulgee Fields are determined eligible to become the first National Register of Historic Places listing for a Traditional Cultural Property, or District, east of the Mississippi River. This distinction recognizes the area's great significance to the Muscogee (Creek) people. Present The park's staff, the OcmulgeeNational Monument Association, the Friends of Ocmulgee Old Fields, and the park's many volunteers remain dedicated to the mission of protecting and preserving this very special place for the enjoyment of today's citizens and future generations.